Traveling to Uganda for the first time was more than an opportunity, for us it was about women, hope, and most importantly water. My sister Kirby (seen left) naturally one of my favorite women, was able to join me on the ride to Moyo. By ride I also mean literally packed on a bus like sardines for eight hours, a ferry across the Nile, and finally a boda boda (motorcycle taxi) to get us to our destination. We arrived eager alongside our backpacks and a slew of red dust to line our nostrils. Moyo town approximately has 25,000 people, and is located in Northern Uganda, close to the border of Sudan. In Moyo, the struggles were immediately transparent, and we knew clean water and resources were slim. There was no sign of economic advancement, not many light bulbs, and plenty of jerry cans empty or bearing dirty water. An interesting, quick observation, everyone had cell phones. It’s very affordable to own a cell phone in Uganda, they are not smart phones, but Ugandans are able to send and receive texts, which is a quantum leap of connectivity. For example their healthcare system keeps them alerted for medications or in regards to water, they are able to communicate to officials if certain boreholes and pumps are functioning properly within their communities. Unmistakably poverty firmly remains entrenched in rural Uganda, HIV/AIDS is still rampant, and access to healthcare and clean water is a constant struggle. We arrived to Moyo alongside Global Water Women’s Initiative Team Coordinator Hajra “Comfort” Mukasa, talk about a passionate woman (seen in image on right). Within a short conversation with Comfort I knew she was ingenous with a sense of fire and punch. 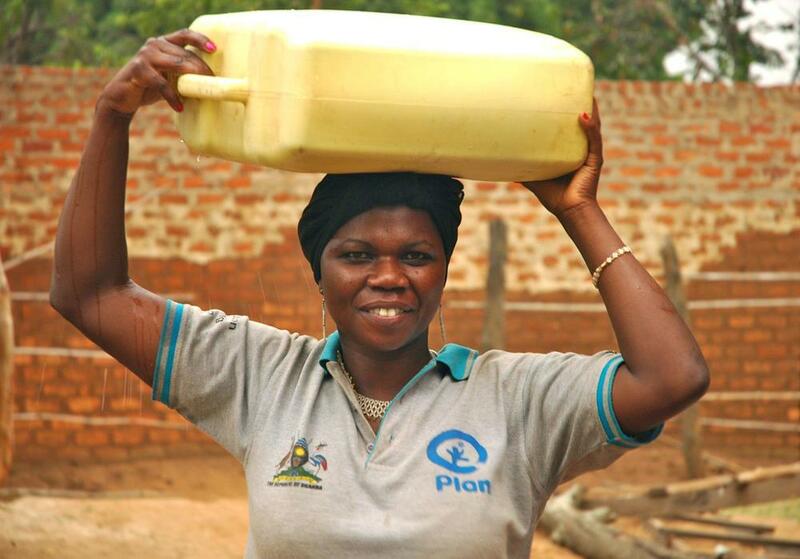 I asked her why she chose to be a WASH (Water, Hygiene and Sanitation) expert, and she replied proudly “It’s what I know, it’s what I believe in.” Could you imagine if we all felt this way about our careers? Some serious business would happen. We shortly arrived to the site of where the ladies of GWWI Moyo began laying the foundation for the RWH or rainwater harvesting system. This is their second tank in the community, their first being at Moyo primary school which gave access to 1,000 children and the neighboring communities. This new tank was being built outside of a local mosque, near many small villages that would benefit from the water system. We arrived with open arms and warm smiles, as the ladies of GWWI consist of about 15-20 women, primarily in their fifties, and a few youth members. Surprisingly they are considered elderly, as their life expectancy in Uganda is 55 years of age. Angella, Martha and Anastasia, the three leaders within GWWI Moyo, sat down with us and gave us a little history on how they came together. 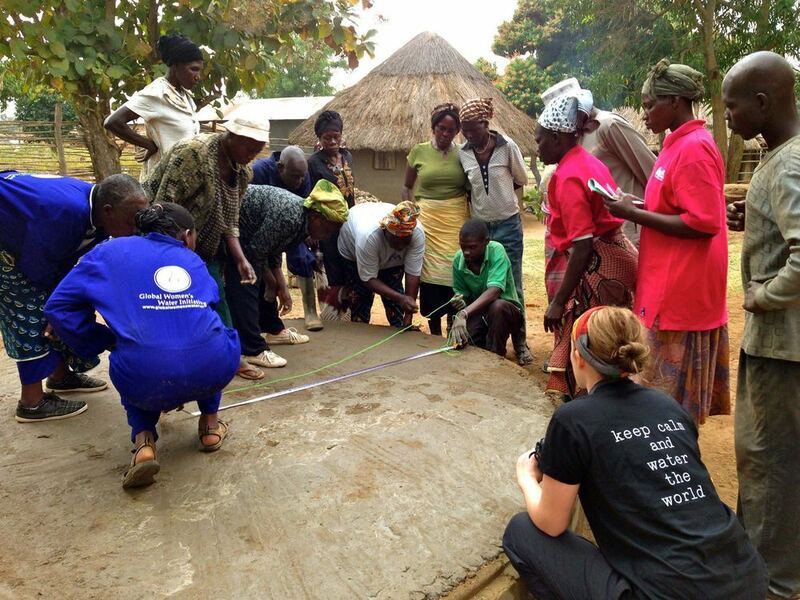 In amazement, these grassroots women have accomplished many goals, from enrolling in WASH training programs to educating their community on the importance of sustainable clean water solutions. 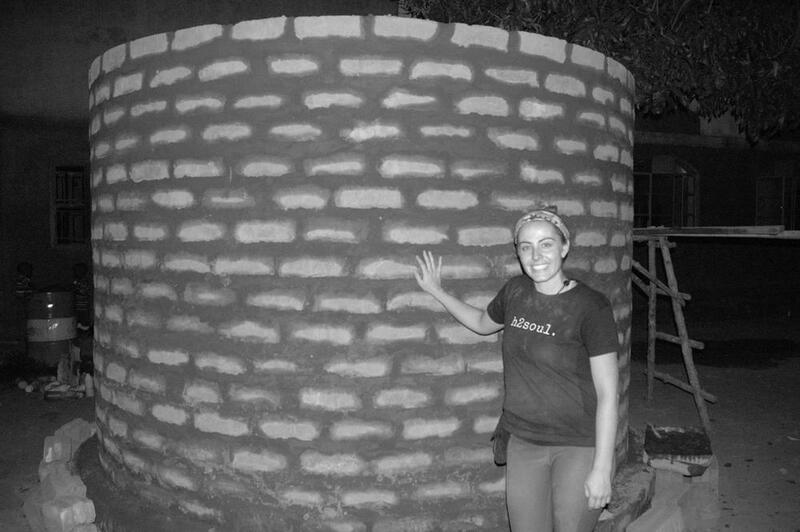 They also mobilized funding to buy an ISSB (interlocking stabilized soil block) machine that enables them to build these rainwater tanks, and they hope to soon build homes for families, and work outside their town of Moyo. Angella says all in all for them it is about working hard for where they are from and being together happily. After the first day of forming the bricks and laying the foundation for the tank, we were at the next stage of laying the bricks, binding them with mortar, and building the tank wall. Godliver Businge who heads up the GWWI team with her expertise in engineering and construction, led everyone on the plan, and enabled every woman to be involved whether by plumbing bob measure, laying, or binding and leveling the bricks to ensure their strength. After a couple hours work, we enjoyed Cassava and African sweet potato with our tea. The Ugandan diet primarily consists of starches such as matoke (plantain), millet, and maize alongside beans or beef, chicken, fish, and goat. During our lunch time and after project, we were able to venture and scope out habitats and water sources, or lack thereof. Being in Moyo and Uganda in general for a short time, there were not many tourists, and we truly felt we had free rein to explore and interact with the local people unencumbered by circumstance. I highly credit the Ugandans for their sense of welcome and conviviality. After a savored tea time, everyone was back to work, and surprisingly more and more people of the community slowly trickled in to lend a hand. We shortly realized throughout the day, with a little more prayer, came a little more action. The people in charge of the mosque were not thrilled in the beginning due to tank placement being directly in front of their mosque. Then ironically after each prayer session, their were more people willing to help and get dirty! By end of day the tank was up, 3 meters high, and ready for plastering, cleaning, roofing, piping, and finally the tap. We cheered, hugged, and stood proudly by the tank, our tank. As Godliver stated, this project is inspirational to her because it’s women coming together to complete such demanding manual labor. And in the Ugandan society, women work longer hours than the men, and bear the double burden of ensuring their households are cared for and fed adequately. To describe this project Godliver says it’s simply wholesome. An incredibly insightful word choice, as it truly represents the water project’s ability to promote health and support the well-being of the community. Wholesome ultimately describes the minds and hearts of the women behind the bricks. singing and celebrating was always in order around the GWWI team. One of my highlighted moments during the construction of the tank, was the ladies had a song they liked to chant throughout working that goes along the lines of “Hey Hey, Moyo Women, We are One, Hey Hey, We Work Together We are One.” On their next verse, instead of saying “Moyo Women” they incorporated “American Women, We are One.” Our eyes lit up and it had felt like freedom, in search of a word to describe the empowerment. We had arrived to that moment, to be surrounded by truly powerful women that came from nothing, to let us in on their love. And by nothing I mean their community was destroyed in a war in 1979, and their lives were uprooted to Sudan, eight years later to return to Moyo that was demolished. They had to start over, and be stronger than ever, determined to help their community move forward. Their return, their ride was a lot more bumpy then ours to Moyo town to say the least. 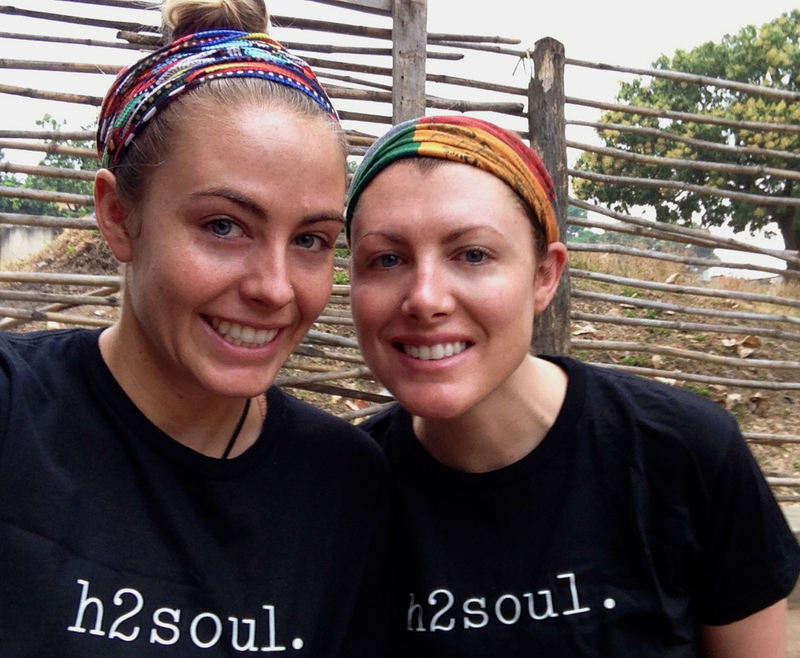 Reflecting at the end of our time in Uganda, the voices of the women resonate in our souls. We are one. We all wake to the same sun, close our eyes under the same stars, breathe the same air, and hope for the same dreams. One day, we will all drink the same water. The Blue Planet Network team reviewing our photos - CEO Lisa Nash (in pink) and Jackie to her right, the amazing coordinator to thank for our once in a lifetime trip. more about Blue Planet Network and how you can help the clean water mission here.